Our clinics offer diagnosis and treatment of many thyroid disorders. These disorders include underactivity of the thyroid, overactivity of the thyroid, thyroid nodules, thyroid enlargement, inflammation of the thyroid, and cancers of the thyroid. Learn more about thyroid disorders on the American Thyroid Association website. Sensitive tests are available for detecting thyroid overfunctioning or underfunctioning. We work with nuclear medicine physicians to offer thyroid scanning which investigates cause of thyroid overactivity. Our clinics specialize in treating these conditions by optimizing thyroid hormone therapy or use of medications to lessen thyroid gland activity. 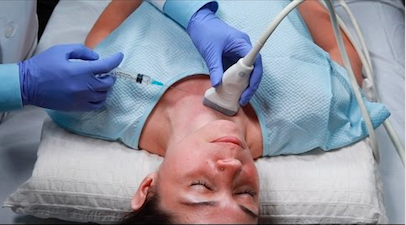 We use thyroid sonograms to evaluate thyroid nodules and enlargement. We work with our radiology department to offer fine needle biopsy of the thyroid, which is performed to evaluate benign or malignant growths of the thyroid. We work closely with other specialists, including radiologists, nuclear medicine physicians, and head and neck surgeons, to provide state of the art diagnosis, treatment, and monitoring for thyroid cancer (see below). Experienced physicians are available to perform fine needle aspiration biopsies under ultrasound guidance. This procedure is very important for diagnosing benign or cancerous thyroid conditions. Use of molecular markers is available. These tests which may help decrease the number of thyroid operations after biopsies that do not provide clear results are available. Appointments for a fine needle aspiration biopsy can be arranged if your initial thyroid evaluation suggests this procedure is indicated. Benign thyroid growths or nodules are very common, and it is important to distinguish them from cancers. Thyroid cancer is less common than other cancers, accounting for about 3% of all cancers. About 60,000 new cases of thyroid cancer are reported each year. It is not as lethal as some other cancers, and excellent treatments are available. Our endocrinologists work with other specialists (radiologists, nuclear medicine physicians, and head and neck surgeons) to provide complete diagnosis, treatment, and monitoring of thyroid cancers. Diagnosis can include thyroid aspiration, radioactive iodine scanning, and thyroid sonography. Treatment can include surgery, radioactive iodine treatment, and thyroid hormone therapy. Learn more about thyroid cancer on the American Thyroid Association’s website.